How long do credit inquiries stay on your credit score? How Long Does a Hard Inquiry Stay on Your Credit Report – Everything You Need to Know! Your credit is one of the most important assets you can have if you are from the US and one of the things can severely affect your credit score is a hard inquiry so it’s common for you to wonder how long do hard inquiries stay on your credit report or when do hard inquiries fall off. Well, we have got you covered with everything you will possibly need to know below so let’s begin. 1. How Long Do Hard Inquiries Stay on Your Credit Report? a. When do hard inquiries fall off? 2. How Does a Hard Credit Inquiry Affect My Credit Score? Credit checks play a part in many of the most important moments of our life (particularly, hard credit checks). From getting a small business loan to start your first business to taking out a mortgage to purchase your first home, in many ways, the credit inquiries that accompany these transactions mark a trail that maps out much of our life. A credit check (also referred to as a credit inquiry or credit pull) gives lenders and financial institutions the information they need to decide if they’re willing to lend you the funds you’re requesting. And while they’re a necessary part of achieving these major milestones, these hard inquiries have a more long-term effect on your credit that you need to be aware of. Q: How Long Do Hard Inquiries Stay on Your Credit? A: Hard inquiries stay on your credit for a maximum of 2 years. So to answer the question of How long do Hard Inquiries Stay on your credit report directly? Hard credit inquiries stay on your credit report for a maximum of 2 years but there is a lot of other factors involved as to how long does credit inquiry stay on your credit report which I will explain below. However, they only impact your credit score (I.E. your FICO score) for the first 12 months, with any potential impact typically occurring within the first 6 months of that window. When do hard inquiries fall off? It’s a bit more complicated as to when do hard inquiries fall off from your credit report. And if you know all the ins-and-outs of how hard credit inquiries work, you can make them work to your advantage even further (and avoid some potentially damaging pitfalls). How Does a Hard Credit Inquiry Affect My Credit Score? When a lender runs a hard check on your credit, your score will typically drop by a few points whether or not you’re application for credit is approved. Keep in mind that this is typically a minor hit, so it’s nothing to worry about. The reason for this is that FICO considers the existence of credit inquiries themselves a sign of high-risk. Those with 6 or more hard credit inquiries are considered by FICO as being up to 8 times more likely to file bankruptcy when compared to someone who doesn’t have any inquiries at all. So, the more inquiries, the higher likelihood of debt. And the greater debt, the less likely you are to pay it all off. Hence, your score takes a hit to reflect that. It’s important to keep in mind that FICO does treat different types of credit inquiries differently and that the same credit inquiry can affect people in different ways. The reasons for this ultimately come down to your own credit history. However, there’s one more important point that can change how individual hard credit inquiries affect your credit score. And it’s a neat little trick that everyone should be aware of (but few are). FICO considers multiple same hard credit inquiries (referred to as “rate shopping”) done within the same period of time (45 days) as one single hard inquiry. Why is this important? When you’re searching for a business loan or are looking to rent an apartment, people often apply at several different locations before they find a deal that works best for them. For this reason, FICO considers these inquiries as one single hard inquiry provided it falls within the 45-day window (assuming they’re all for the same purpose). This is great to keep in mind the next time you’re shopping for a loan or are looking to apply for credit to make a purchase because you can use this to your advantage to not only maintain your current credit score (only taking the hit of a single hard inquiry) while maximizing your opportunities to shop around for the best deal possible. This is a common question, so we wanted to make sure to cover it here. Keep in mind that you can’t take hard credit inquiries off of your credit report if they were authorized by you. Despite this, considering a hard inquiry drops off of your credit report after just 2 years– and depending on how immediate your goals are– allowing a hard inquiry to fall off your credit report may be the ideal option anyway. However, there’s one exception: if you notice a hard inquiry on your account that you did not authorize. Did you know that an estimated 1-in-5 Americans have an error on their credit report that makes them appear riskier to lenders than they actually are? It’s now more important than ever to review your credit report on an annual basis to check for potential discrepancies. 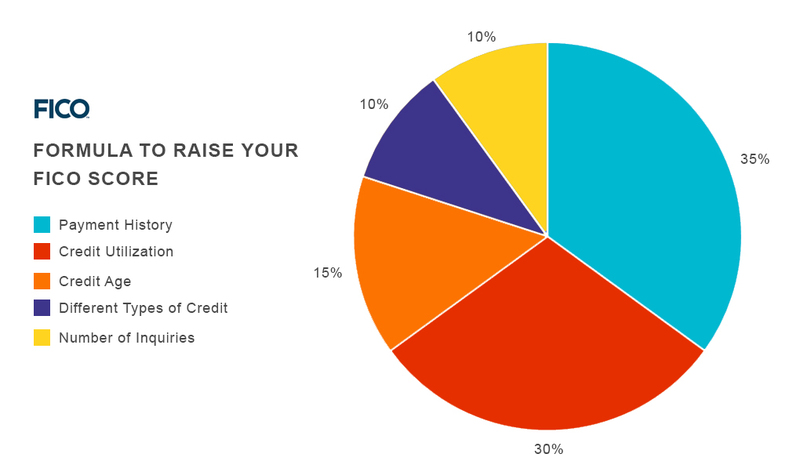 According to Credit sesame Number of inquiries comprises of 10% of your credit score. But why does this happen? Isn’t FICO looking out for us? The reality is, our credit reporting system is huge. And because of its size, it tends to be less accurate than it could be. The result is what was just mentioned above: millions upon millions of consumers end up with discrepancies on their credit report which should have never been placed there in the first place. And the worst part is, this can affect your ability to get approved for a loan without you even knowing it (if you’re not checking your credit report beforehand). Jeanne Kelly, a credit expert at Jeannekelly.net, suggests checking your credit at least 3 months before big purchases to give yourself enough time to fix these discrepancies. So, start first by getting your free credit report. Once you’ve done this, skim through to the section called “credit inquiries” and look it over. Is there anything there you don’t notice? Something you for a fact shouldn’t be there? Contact the creditor yourself to dispute the inquiry. Hire a specialty service to contact the creditor on your behalf. If you’re contacting the creditor yourself to dispute the inquiry, request that they remove the record from your report. It’s rare, but if they resist, you may want to request whatever information they have on the inquiry and take it to a professional who can fight to take it off of your report for you. Remember, hard inquiries only affect your credit score for one year and typically it’s a much shorter period of time than that (6 months). Look over your current goals. If you have no large plans on the near horizon, such as applying for a small business loan or mortgage, then there really is no need to worry about any hard inquiries on your report because they’ll all have dropped off before they’d be an issue. Just make sure to review the rest of your credit report for the potential of credit fraud as an unauthorized hard inquiry may be an indication of this. As Experts in the financial field, Excel Capital knows the importance of asking one’s self How Long do Hard Inquiries stay on your credit report. This is something that every consumer and business owner must know before applying for credit. When an Underwriter evaluates someone’s credit they take into consideration the number of times in a given time period that a credit hit was made.